Kabuto Live Updates: Reliability Improvements, File Download Capabilities, and More! Today we come bearing gifts. Gifts in the form of Kabuto Live updates from the RepairTech team! We’re happy to share that we’ve heard your feedback and have been working away on making Kabuto Live more stable, reliable and useful. Let’s dive in. 1. Log into your Kabuto account and head to the Devices tab. 2. Pick the Device you’d like to download a file from, and open up Kabuto Live by clicking on the button in the top-right corner of the page. Note: If you have previously received confirmation from your client to remote into their Device for a certain number of days, months, etc., and you’re still within this window of time, you will be taken straight into the Kabuto Live. If the client still needs to grant you permission, you will be prompted to request permission from them and will need to wait until they’ve done so in order to access Kabuto Live. 3. Once you’ve successfully remoted in, head over to the “File System” tab and choose the folder, then the file you’d like to download. 4. Click on the file name to prompt the “Download” button, then click the button to download the file. 5. 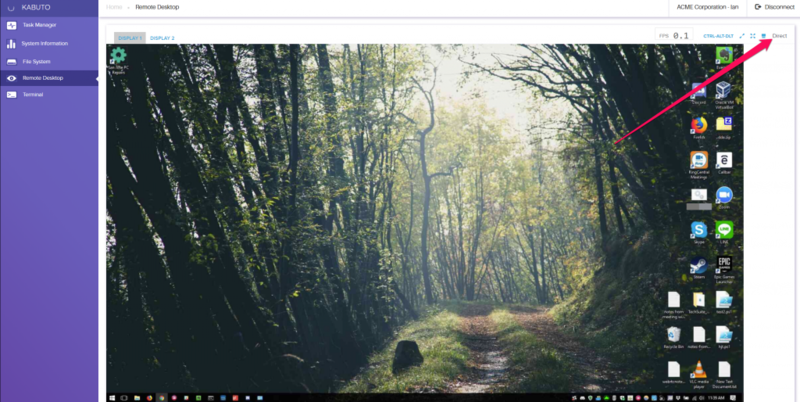 Follow the remaining prompts to choose a destination to save the file on your computer. Note: As of now, Kabuto Live only allows for one file to be downloaded at a time. Stay tuned for mass file and folder download capability! When we first launched Kabuto Live, we built it using WebSocket technology, something we are now calling a “Relayed” connection. What this means is that our servers act as a middle-man between your computer and the computer you’re remoting into (a standard practice in remote access technology). What we’ve recently brought to Kabuto Live is the ability to have a “Direct” connection, which uses WebRTC technology. This involves a peer-to-peer network connection, which avoids the need to use a middle-man, as well as makes connections much faster and more reliable. By default, Kabuto Live will use Direct connections whenever possible, however, it is solely dependent on how your network is set up and is therefore something we cannot control. WebRTC is known to not work with some firewall types and certain double NAT situations. 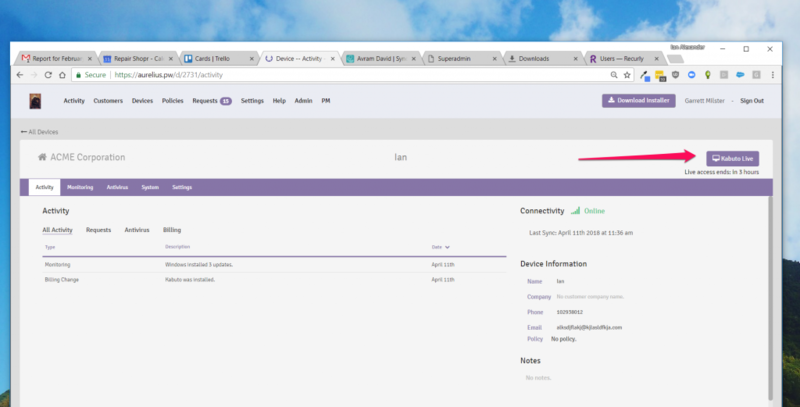 To find out what type of connection your remote session is using, reference the text in the top right corner of your session’s page. The FPS Counter is a tool that counts how many frames per second Kabuto Live is receiving during a remote session. So, if there is no activity happening on your end or on the user’s end, the FPS Counter will show a count of zero. As activity changes, the FPS Counter will reflect the current frames per second it is receiving. This is especially useful when debugging or diagnosing device issues, as you can use it to determine how good or bad the connection is. Fixed multiple connection issue types to increase success of connecting on the first try. Implemented an automatic reconnection function so Kabuto Live will continue to try to connect if a connection fails. Improved the responsiveness of mouse clicks which were previously delayed and caused clicks to occur in unintended locations. Fixed a variety of “Remote Host Not Found” errors. Got rid of many performance-related issues that were causing slow speeds. And it doesn’t end here! 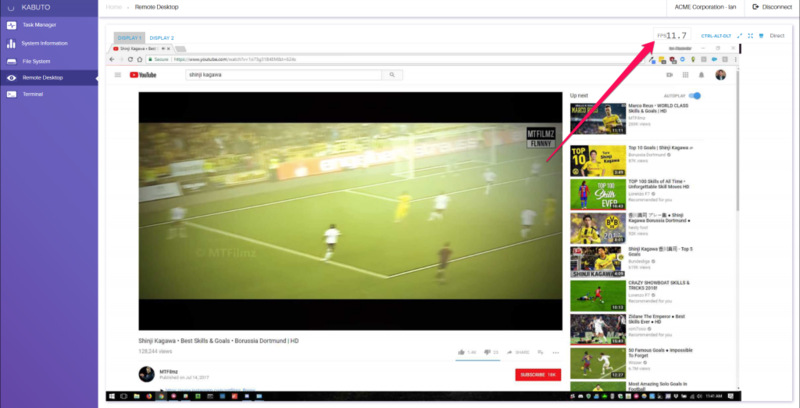 We are consistently working on improving Kabuto Live for our users and plan to bring you copy/paste improvements and support for Firefox in the near future. Please stay tuned for more, and let us know what you think by emailing support@repairtechsolutions.com.